For each quesadilla, spread 1 tortilla with 1 tablespoon of the pesto. Top with 1/4 cup of the chicken, 1/4 cup of the spinach and 2 tablespoons of the cheese. Top with a second tortilla. Heat heavy skillet over medium heat. Add 1 quesadilla to skillet. Cook about 2 minutes until bottom is lightly browned. Carefully turn; cook 2 minutes longer until second side is lightly browned and cheese is melted. Repeat with remaining quesadillas. To serve, cut each quesadilla into 4 wedges. If you have a cast-iron skillet, it works well for making quesadillas. 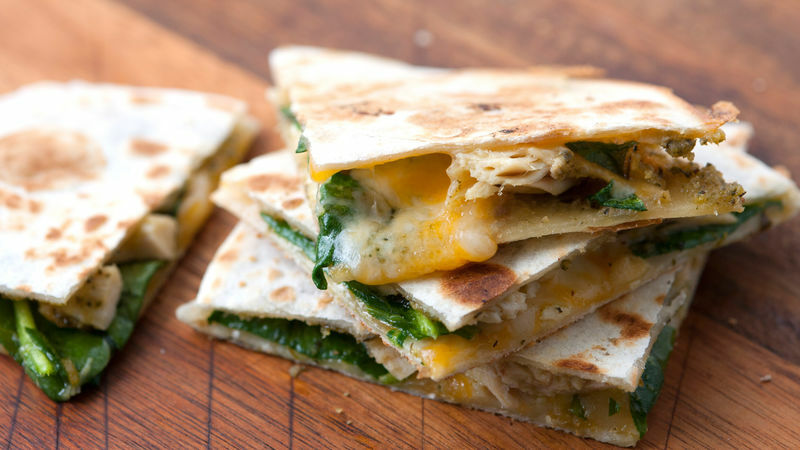 You can also make these in a panini press, or use a large griddle to cook all 4 quesadillas at once. Have some deli turkey on hand? Swap it for the chicken.